I love when I get to meet and love on you ladies in person! I feel so honored that you read these blogs, and that they’ve been a blessing to your life. I am so invested in empowering my sisters to get the best out of every area of life – whole life prosperity is what I’m after for you. I may not be able to talk to and greet every one of you, but it is my weekly prayer that something in these blogs creates a life-altering aha moment for you that will cause you to see greater and pursue greater. This genuinely being my heart towards you, I want to hear from you! If there’s a subject or a question that you would like to talk about, click on the link below. I want this blog to connect us as sisters. This is our safe place. Let’s talk about it – whatever it is. Your name will not be mentioned when posted, but this is so important to me because your question can free someone else! Let’s help one another and talk about it! Watch the video below of this cutie I met while out of town last week! Thank you again and again for reading these blogs and weekly meeting me here at our virtual meeting place. I love you! Thank you for sharing, I look forward to reading the blog every Monday. I am sending the link to my cousins so that can sign up to. Love it! And likewise, I appreciate your beautiful blogs of inspiration and I appreciate you Dr. Dee Dee. Be blessed! It was a pleasure meeting you I have watch your and Dr.Mike years ago, I will apply what u ministered to me in my life, thanks for the encouraging words and I will inform u only how things go, blessings to your family and ministry. Thanks Dr. DeeDee. You are a joy. I would like to hear what you have to say about going through the change of life, menopause. I have been challenged with hot flashes and sleep issues. I have tried a natural AM/PM supplement, extra sleepy time tea, lavender, and now I’m using Magnesium oil which is helping. What advice/suggestions do you have for us? Yes, your blogs are a blessing. And they have helped me to connect with other sisters in the Lord. I to agree with prosperity for the whole person in every area of our lives. Be Blessed. Thank you Dr. DeeDee for taking time out your busy schedule each week to post these inspirational messages. I know you have a heart for women. I thank God for the anointing that’s upon you. Women need women that are truly genuine and I can certainly sense that with you. Continued blessings to you! Awwww!! So sweet! Yes, these blogs are a blessing and forgive me for not passing this great wealth of information on. I will send the ladies in our church a “Group-Me” message and let them know to join in and pass on the good news! Thanks for impacting ladies all over the world! I’m going to think of some topics you could cover and I know whatever it is, you will have a right now Word of encouragement and direction for us all! Love you life beautiful lady! Have a Marvelous Monday! Thank you Dr Dee Dee! You are indeed a Blessing to the body of Christ. I wish you and Dr Mike will make e-copies of your books , so Readers can purchase and download them on their devices! You’re blogs are always so timely, I also look forward to my Mondays email. Thanks for being so transparent with us and encouraging us to do better in every area of our lives. Awwww! That’s so cool!! I send your emails to my neice every week as well. Hopefully, she’ll subscribe soon and be officially connected to this great sisterhood of love and encouragement. OH WOW!!! I LOVE THIS. THANK YOU FOR SHARING. Hello DeeDee, I thank you for all of your blogs. They inspire me to be a better Women of God. I would definitely love to come to visit your church one day. I live in Philly which is not very far from you. I love how you fought for your husbands life. That is how I started following you because I watched those shows. You are such a strong Women of God and I admire you very much. I strive to be that Women of God to everyone I come in contact with. I thank you again. God bless you always! Many blessings to you and your always. 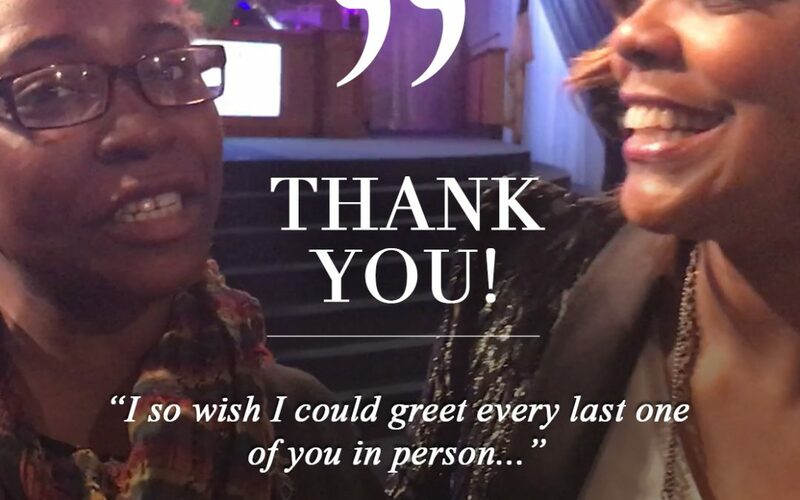 Dr.DeeDee thank you for the personal note before your blog. I get excited when Monday comes because I look forward to reading your blog. I have 2 sisters who enjoy reading also. Hoping we can chat after bible study. I thank God for how you touch women from around the world. You really have impacted my life. We give God thanks and praise for you, your heart and wanting better for all of us. It means so much to me/us for you to take time out of your extremely busy, busy schedule to love me/us through your blogs. We thank you and we love you so very, very much. This is awesomeness. I love it when we, sisters can relate and encourage each other no matter the distance. God is good! Dr. Dee I love ready your blogs, they are so uplifting. Dr. Dee, I Love it & I Love You, thank you for being such a powerful example & creating a blog where women can feed off of each other in a positive manner. Dr. Dee Dee!!! I am so honored you are my First Lady and Co-Pastor to our Man of God!! You are changing lives all over the nation, all over the world!!! Thank you for being approachable and down to earth!! I love & appreciate every blog you post. You are genuine and I value you. Your blogs truly have stirred me up! I love you too Sis. Deedee, blessings to you and your love ones…..
I’m blessed to be connected to you through your blogs. I look forward to them every week. I just want to say thank you for sharing great inspirations and truths. You are a great example for us in the Kingdom. I appreciate you! Thanks Dr. Dee Dee for always having our backs! Your blogs are always right on time. You are truly the real MVP. It’s funny how your blogs meet so many women at that point of need and we are all going through so many different things. The message is the same, and it fits all our different situations. Starting over 50+,mental breakdown,empty nester, divorce,low income job,caring for senior parents (dealing with senior personalities),trying not to be disrespectful, praying, overwhelmed,I love the Lord- becomes very frustrating, too much guilt to walk away, ???? ?